[SatNews] SES Government Solutions (SES GS) is one of 14 awardees granted a share of a contract worth in total a maximum of $494,900,000 under the Hosted Payload Solutions (HoPS) Program. This indefinite-delivery/indefinite-quantity (ID/IQ) contract will provide a streamlined method for the U.S. Government to host government payloads on SES spacecraft. 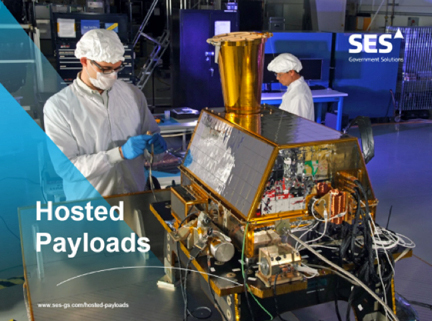 At a time when many government satellites programs have experienced schedule delays, cancellations and budgetary challenges, the use of commercially hosted payloads can maintain or accelerate program schedules and provide timely and affordable access to space. The U.S. Air Force broke ground with the Commercially Hosted Infrared Payload (CHIRP) aboard the SES-2 spacecraft, which was launched on September 21, 2011. Missions suitable for hosted payloads include risk reduction activities, technology advancement missions, flight qualification missions and operational missions such as earth weather monitoring. The contract has a five-year ordering period starting July 10, 2014. All missions and studies under this contract are expected to be completed no later than January 31, 2029. Space and Missile Systems Center is the U.S. Government agency responsible for contracting the activity.